There's a good chance you have seen a doll created by this talented fiber artist Noreen Crone-Findley. She's the author of Soul Mate Dolls: Dollmaking as a Healing Art, published by Krause, and her designs have appeared in Vogue Knitting, Great America Crafts, Canadian Living and many other magazines. She also taught classes at Crochet Renaissance this past fall. What motivates Noreen? 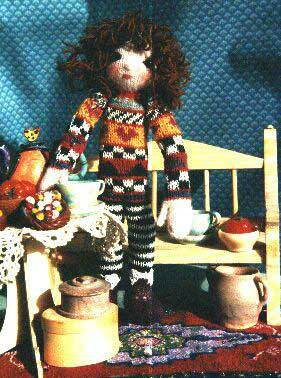 In her words: "I am the author of "Soul Mate Dolls: Dollmaking as a Healing Art". I'm also a wife; mother of a daughter and a son; a designer; a doll artist; a workshop facilitator and a professional puppeteer (I perform approximately 250 shows a year to young children, hopefully inspiring them to take good care of the Earth). "I really love playing with fiber. I enjoy using unusual techniques, such as weaving, crochet, knitting, embroidery and paper shaping in my dollmaking. I believe that the art of dollmaking is a wonderful way to open doorways to creativity, healing and wholeness. I am passionate about knitting, crochet and small loom weaving, and am always working on new designs that will inspire my readers and workshop participants to pick up their hooks, needles and small loom! "I hope that my designs will bring you pleasure and delight. I wish you all good things, in all ways!" Elspeth is worked in stockinette stitch (knit on the odd-numbered rows and purled on the even numbered rows). Elspeth's sweater is worked in Fairisle knitting, which means there is more than one yarn color in a row. 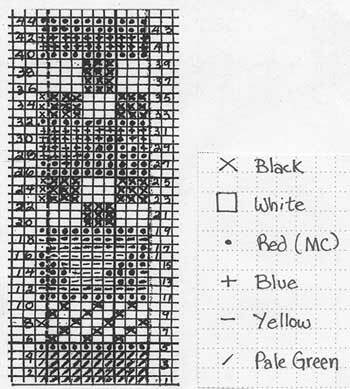 The sweater pattern is charted, which means there is a graph (each square of the graph represents one stitch). In each square is a symbol telling the color in which that stitch is worked. You carry the unworked yarn behind the stitches, on the wrong side. Feel free to work the doll in your own color choices. When you are reading a chart, you begin at the lower edge. Cover Row 2 with a strip of card stock while you are knitting Row 1. As you work each row, slide the strip of cardboard up, revealing only the row on which you are currently working. Read odd numbered rows on the chart from right to left, and even-numbered rows from left to right. After you finish a row, it is a really good idea to use a row counter to keep track of where you are in the chart. By counting rows, you will know exactly where you are in the pattern, even if you have to stop knitting. The finished size of the doll is determined by the size of the knitting needles and thickness of the yarn that you use. Noreen has provided several options below and it is possible to substitute other yarns and threads. Remember to check the gauge of whatever yarn you are using. If you use Patons "Décor" and size 7 (4 mm) knitting needles, Elspeth will be approximately 20" tall. If you use Patons "Country Garden" or Naturally "Magic Garden Buttons" and size 5 (3.75 mm) needles, she will be approximately 15" tall. If you use size 1 needles (2.25 mm) and pearl, embroidery or crochet cotton, Elspeth will be about 10" tall. NOTE: The head and body are knitted as a unit, and the arms and legs are knitted separately, then sewn on after the knitting is completed. 8 stitches and 13 rows = 2"
12 stitches and 16 rows = 2"
13 stitches and 16 rows = 2"
16 stitches and 22 rows = 2"
Using flesh color, cast on 10 sts. Row 1-4: Work in St st.
Row 1: (k1, p 1 in same st) in each st across (20 sts). Row 4-44: Follow chart, repeating chart 4 times across for Elspeth's body. Cast off. Work 30 rows, alternating 2 rows of white, 2 rows black, then change to Boot color. Row 43: K 6, (k 1, p 1, k 1 in next st) 6 times, k (30 sts). Row 55: K2tog across (21 sts). Row 1: Cast on 10 st and knit across. Row 3: (k 1, p 1) in each st across (20 sts). Rows:43: K 3, turn. Work 5 rows St st on these 3 sts. Next Row: K3tog, break yarn, draw through st.
Row 44: Rejoin yarn and k across remaining sts. Row 53: K2tog across to last st, k 1. Row 54: P, then break yarn, draw through all sts, draw up. Sew center back seam. Stuff. Stitch to lower edge of Body. Embroider shoe laces by threading a darning needle with the shoelace color, and stitching a zigzag pattern as if you were lacing a shoe. Stitch seams in arm and thumb. Stuff. Sew to body. The Baseball stitch is a good choice for joining edges. Hold the two pieces with their wrong sides together. Starting at the right hand side, you will be making a "v" shaped stitch. Bring the needle up from the gap to the outside of one side, go back down into the gap, up and out the other side. How to place the features. Sew the eyes at the horizontal midline of the face. The ears also go at the midline (Think of how useful ears are for holding up your glasses!). If you drew an imaginary line halfway between the chin and the eye line, you would have the perfect placement for the nose. Now, another imaginary line halfway between the nose line and the chin, and you have the perfect place for the mouth. When embroidering the features and sewing on the eyes, remember to anchor the thread at the back of the head. Firmly sew on appropriate size eyes, at the imaginary eye line. The nose and ears are made by holding the knitting needle against the head, horizontally for the nose, and vertically for the ears. 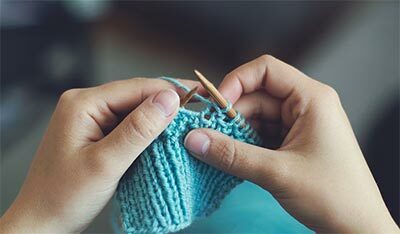 Bring the flesh colored yarn up through the head, and stitch over and over the knitting needle, then take the darning needle out the back of the head and anchor the yarn by stitching in place several times. Pull the knitting needle out of the stitches. Embroider the mouth with dark pink embroidery floss, referring to the photograph. Lightly wrap yarn around 4 fingers. Snip end from ball. Slip the scissors into the loops of yarn. Snip the loops once to give you the lengths of hair. To attach them to her head, fold them in half to form a loop. 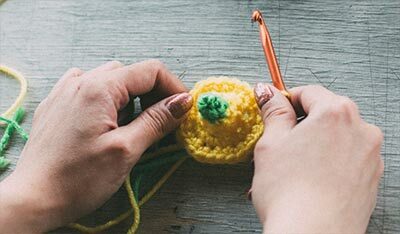 With a crochet hook, pull this loop through a stitch on her head. Pull the ends through the loop. Continue until she has a full head of hair. To make bangs, wrap the yarn around just 2 fingers and use the shorter lengths of yarn across her forehead. You may chose to sew a small piece of lace around the top of each boot. Elspeth© is an original, copyrighted design. It is reproduced by the Craft Yarn Council of America at its web site by permission from designer Noreen Crone-Findlay.